Concord, North Carolina (April 11, 2019) – Current ARCA Menards Series’ points leader Christian Eckes is hoping to relive the magic of his first ARCA win when he straps back into his Venturini Motorsports’ JBL Audio Toyota Sunday afternoon for the series’ Kentuckiana Ford Dealers ARCA 200 at Salem Speedway. Off to a strong start with one pole position and top-5 finishes in the season opener at Daytona International Speedway and last month’s effort at Five Flags Speedway, Eckes goes into ARCA’s third round holding a 65-point advantage in the driver championship point standings. 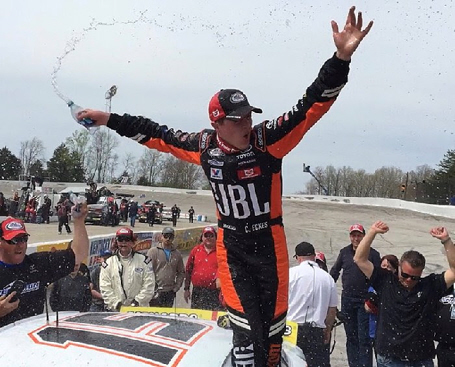 Joining VMS’ stable in 2015, Eckes, now 18, saw limited action making 15 ARCA starts before breaking into the win column at Salem Speedway during last year’s spring race. Showing speed throughout his young career, Eckes’ first win opened the gates to further success as the talented teen went onto to capture two additional trophies during the 2018 season – winning on the dirt at Springfield and then covering the field at Lucas Oil Raceway later late in the season. Overall Eckes has made 29 series starts earning three General Tire Pole Awards, three victories, 12 top-5’s and 20 top-10 finishes. Poised for a full season effort with VMS, Eckes’ past experiences help pave the way for a strong championship run in 2019.